Published on August 1, 2018,	by admin in New Mexico Summer. There are five state parks a few miles north of Las Vegas, New Mexico, and the one I’m camped at has the only working dump station. I left Storrie Lake yesterday and drove 40 miles north to a nice little state park named Coyote Creek. Coyote Creek SP is small but quite pretty. It’s in a wide valley surrounded by mixed pine and hardwood trees with a small stream running through the park. 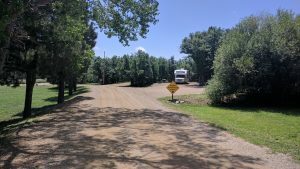 There are about 10 RV sites with electric and about the same number of developed, non-electric sites you could get a small RV into. The electric sites are packed together in a side-by-side, crowded line. One road to more camping spots, crosses the stream and runs up the hill, and is mostly for high-clearance vehicles and tenters. There is also a small field down by the river for overflow camping. At 7700′ of elevation, the temperature has been nice. It was a bit chilly this morning but warmed up into the 70’s quickly. Today I hiked a trail that circles the stream side of the park and climbs up the hill for a mile. Of course, every afternoon the monsoon thunderstorms move in and chase everyone inside. I get 3 bars of 3G on Verizon. It’s not great but adequate. 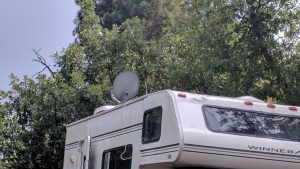 I had to put my dish up on Minnie’s roof to get above the trees. I get enough sun to get a full charge every day and all this rain is keeping my panels clean! I’m heading back to Storrie Lake State Park on Friday. I ordered something from Walmart that should be at the store in Las Vegas by then. All the good spots at the state park will undoubtedly be filled on Friday, so I will park in the field down by the lake. Glad you finally found a place to keep cool.